So, we are once again in a Month of Pestilence™ – between living directly behind the folks with the dog rescue (the poop…good gahd, the POOP!) (seriously, do not go into our backyard when they are doing the scoop-duty [doody?] back there…you will be rendered completely unconscious by the stench…and then you will suffocate, possibly to DEATH, because seriously, that smell is just…wow…) and being adjacent to horse-worthy ranchettes, you can probably imagine the kinds of fly problems we have several times a year. Yessir, luxury livin’ out here. If it isn’t Fly Season, it’s probably either Fertilizer Season or Plowing Season. Take your pick: Flying vermin, fascinating Eu du Cow Poop aromas, or dust, dust, dust, dust, DUST! ANYWAY – yeah. The bugs, they are a-breedin’ and a-swarmin’ and every single day I must swat two dozen or more flies, and yet they are still everywhere. I killed every single fly I could find on my lunch break today, which was – totally not lying – over twenty of them. Went back in the kitchen three hours later? => dozens. DOZENS! of them, swarming up and down the windows, waggling their tongues at me, doing intricate line-dances up and down the countertops, rubbing their filthy little hands together like debt collectors eyeballing a particularly ripe mark…argh!! I have a real problem with flies. They gross me out way out of proportion to their actual nastiness, you know? I have less of a problem with, say, horse excrement than I do with the flies that like to congregate on it. Like, I wouldn’t mind picking up the nice clean horse poop with my bare hands, but omg, no, ew-ew-ew-ew, yuck, grossssssssss, there were FLIES on it!! I do not claim this is particularly rational of me, or even remotely sane of me for that matter, but, that’s just how I am about flies. I’ve tried deputizing Denizens to hunt them after school (they get bored and wander off fast). We just replaced all the windows – ALL THE WINDOWS – and their screens (still getting in, somehow). I even tried the poisonous window-stickers, even though it made me kind of anxious to have, you know, insecticide ON my windows. Meh, did almost nothing. I’ve tried spraying the screens with repellent, which added a fantastic scent to the house and made opening the windows pretty much a nonstarter for a while, but which seemed to do exactly nothing to reduce the infestation. 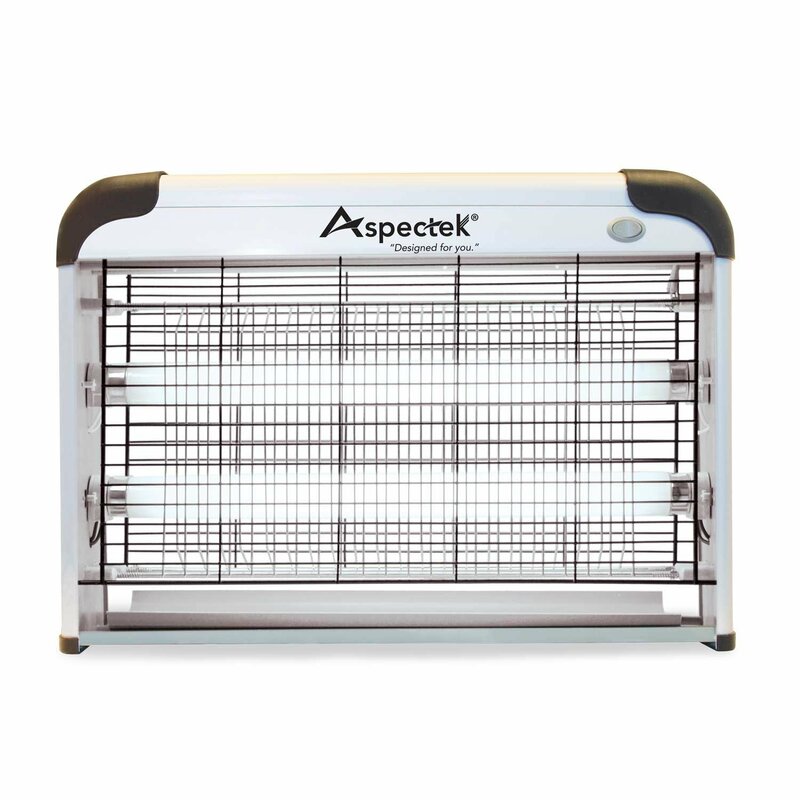 And that’s how I came to order this little baby: INDOOR bug zapper. …say hallo to mah leetle friend…! It’s got a UV light in it that attracts them, and then they hit the wires and zot! – or so they claimed. And I was starting to feel as though they were biting me (they weren’t, it was just that ‘I’m so creeped out that my brain is helpfully supplying me with the sensation that I appear to be so determined to feel’ thing kicking in), so, bam, into the cart, ship it, get it here YESTERDAY, please-n-thank-you. This afternoon, Captain Adventure skidded sideways into my office to announce that the delivery person had left something on the porch, and there it was. We took it into the kitchen (which is currently pretty dark, because meanwhile in other news it is [checks thermostat] 106 degrees outside [!!!! ], so I’ve got all the curtains drawn to keep us from dying of either heat stroke or the electricity bill), set it up, plugged it in…and turned it on. Less than fifteen seconds later…crack! We both jumped, shrieked, and giggled. I felt guilty for giggling, because it seems to me that even if we’re talking about my dreaded enemy, the common housefly, there should be some solemnity involved in their passing. But in my defense, y’all would have to hear this crack! It’s like a mini lightning bolt from $DEITY, reaching out and smiting the wee sinners as they nefariously buzz to pollute some innocent fruit or other with their nastiness. Even when you know it is going to happen, when you’ve been warned that it will be a loud, sharp cracking noise, it’s still…incredibly startling. And then…I walked across the room. The air around me moved, and the flies took to their wings and began that cloud-like swarming they do whenever the air moves, and the next thing we knew it was like $DEITY was makin’ popcorn in there. It had eliminated eighteen of them in the first ten minutes. How many of these do you have now? 2-1500? Either that or we start erecting "the DOME". I always knew you are my long lost twin! Imagine living in a country where they don't have screens on their windows and being a mosquito magnet? Yes, that's me. None of the Brits understood my delight when I found a fly-wire screen on sale in the Lidl supermarket - just apply to your window with Velcro. For the first summer ever I have been able to leave the kitchen window open while cooking and not been invaded by flies/wasps/mozzies/midges.